Although breastfeeding is nothing to be ashamed of, many moms aren’t comfortable with doing it in public even though they don’t mind others doing it. However, it is a fact that sometimes you just must feed your little one in public and the only solution to your problem is a nursing cover. These amazing covers are perfect for offering you privacy and a much needed feeling of security while breastfeeding in public or around family or friends. And what is so great about nursing covers today is that they come in different designs and are stylish and chic so you can feel even better while breastfeeding on the go. There are not only different designs to choose from, but different types of covers as well so you can choose one that suits your needs perfectly. Each of them has their own advantages, disadvantages, and learning curve. What you need to consider when choosing is how you plan to use it (nursing or pumping), how important full coverage is to you, and your baby’s personality, if you’re nursing. As always, we will make things easier by choosing 10 of the best nursing covers offered on the market today. You will surely find the one that is best for you among them. We love this multi-use nursing cover because it can also be used as a scarf for yourself! You can drape it according to your needs. It can even cover your entire back while you are nursing which is an issue with apron style covers. What is also so great about the Itzy Ritzy is that it is light and breathable and can be used in any weather. The one downfall is that you can’t use it for covering yourself while pumping as it covers one side at a time. This is the perfect nursing cover for mommies who’s babies have allergies or eczema and have to be very careful what they come in contact with. Made from the softest organic cotton this cover won’t irritate the baby’s skin when it comes in contact with it’s delicate fabric. We love it! You will love this cover for so many things, like the chic patterns it comes in, the fact that it is machine washable and most importantly because it is made from 100% cotton. The multi purpose Bebe au Lait cover gives great coverage and offers maximum privacy or you and your baby. The rigid neckline will allow you to watch your baby as well as provides good airflow. Just perfect! If you are looking for a stylish, chic nursing cover we recommend the Oslo nursing cover by Dria. 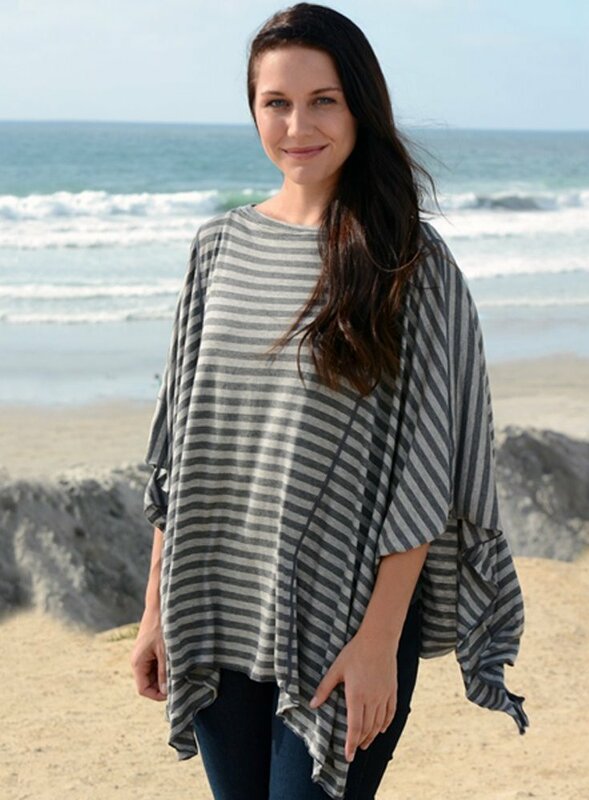 This lovely jersey t-shirt style cover goes on just like a poncho. It offers comfort with its light, soft fabric which is actually organic modal – a material two times softer than cotton. And this cover is multi functional – you can use it as a cover for your stroller or car seat and when you stop nursing you can use it as a beach cover. Stylish yet practical. Multi functional nursing covers are rightly becoming more and more popular. Take a look at this stretchy multi-use cover that has not one, but three uses! It can serve as a poncho-style nursing cover, a car seat cover, and a shopping cart cover. It is actually a large piece of circular fabric with a hole on top, so you can easily put it on for a maximum privacy while nursing. You can use this cover for pumping and it is suitable for any weather. Talk about a game changing nursing cover! Actually, a nursing dress. Just imagine wearing a chic dress that has hidden zippers that allow you nursing and pumping privacy without even taking it off. This amazing nursing dress is for real and offers everything mentioned. And it is so stylish you can even wear it in the office or for an evening out. Do you still consider buying a regular nursing cover? We thought so. Udder covers are probably the most popular choice among moms. And we totally get it – they are made with 100% cotton, very breathable and machine-washable as well. Plus the neckline is rigid so you can see your baby while it feeds. They also come in very cute designs so you can choose the one you like the best. 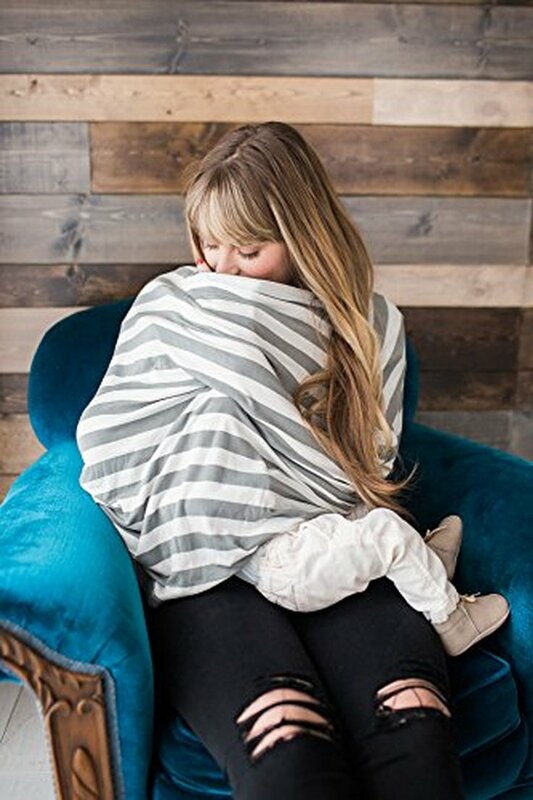 This beautiful chic shawl is long enough so you can swathe your baby and cover your belly and feed comfortably in public, in bed or on the sofa. It is a brand loved by celebrities including Lily Allen, Jennifer Garner, and Kimberly Wyatt. we love the fact that the shawl is multi functional and you can also use it for swaddling your baby, or as a post-breastfeeding wrap. If you are looking for a chic nursing scarf that will go with any outfit then this is the one for you. No one will even realize what it is until you start nursing. And check out the sheer fabric on top – it serves as a window so you can check your little one while you are feeding. 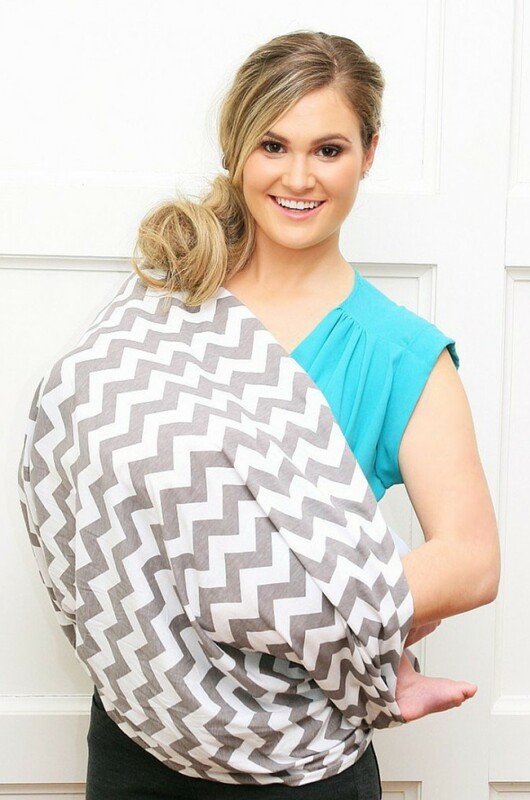 This 100% cotton breastfeeding scarf is made in the UK and is endorsed by X Factor winner Sam Bailey. 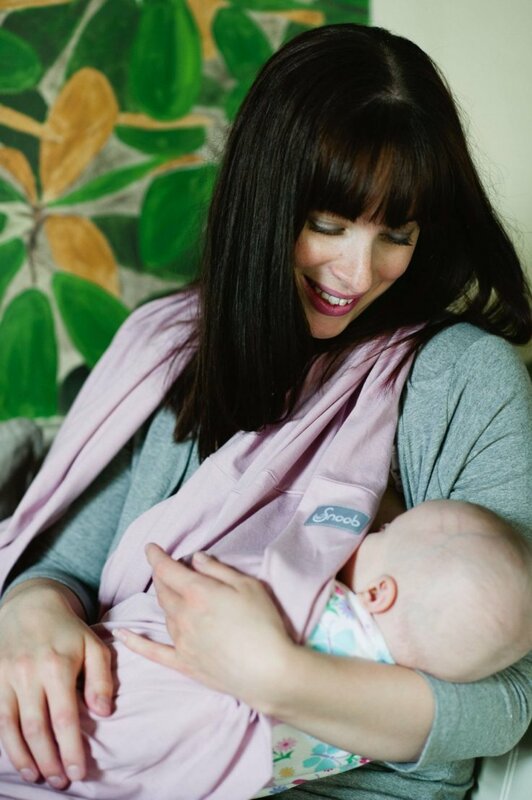 The Snoob is the brainchild of two mums-of-four, who wanted to create a stylish scarf and breastfeeding cover in one. What is so great about it is that you can tandem feed twins with it. The long loop means there’s no need to move it around as your baby changes sides.